Music lovers always try to search for their best possible stereo systems, speakers and compact devices. Luckily, modern technology helps them in making their desired product; Logitech Ultimate Ears Boom 360 is among those products. It is a portable Bluetooth speaker, which produces sound in the 360-degree span. Therefore, all the people present in the room or in the hall receive equal sound energy. 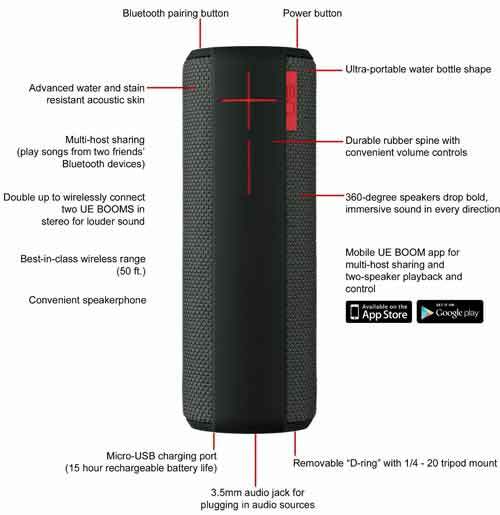 Logitech Ultimate Ears 360 is a wirelessly connected portable speaker that requires Bluetooth or NFC technology to connect with your phone, tablet or any mobile device. Let’s have a brief look at its features so that you can better understand what actually this speaker is? In order to pair your mobile device, make sure that it runs on iOS or Android platform only, because the app is designed only for iOS and android devices to communicate with the Ultimate Ears Boom. Moreover, if you have large gathering of your friends and want to spread the sound and pump up the volume, then you can connect two Logitech Ultimate Ears 360 together and play via mobile device. In this manner, you will get powerful loud sound among the large crowd. The design of this Ultimate Ears Boom is made cylindrical to deliver good quality sound in every direction. Therefore, you don’t need to change the face of your speaker to get the clear audio. It delivers sound with high vibrant, deep base and clear mids. The sound is much clear that you can even use it to receive phone calls. UE Boom 360 is powered by a long run battery, which can deliver up to 15-hours on full charge, so, keep it with you outside and enjoy music all the day. The rechargeable Lithium-Ion battery takes 3-4 hours to charge completely via micro USB charger. You can check the charge status of this UE speaker by tapping the ‘+’ or ‘-‘ button, which tells you how much power is left. One of the prominent features of this UE Boom is its resistance against water and stain. This is due to the colorful acoustic coating of plasma, which provides protection against water and any kind of scratch. Whereas, the rubber pad is also available to protect the USB port and audio jack, so that you can easily enjoy the moments with your friends at any place without taking care of your speaker. Where to Get Logitech Ultimate Ears Boom 360? After knowing above outstanding features, if you have made up your mind to enjoy your next friends gathering with this Logitech Ultimate Ears Boom 360, then you can easily grab this device from Amazon store. It is available in 10 variant colors at smart price of just under $200.